Foil the Plot: Why Do We Really Love Stories? Why Do We Really Love Stories? The other day I was going through a bunch of the books I've reviewed and I noticed that I've rated most of them as "average." And that got me thinking. It's not like these books are bad by any means, in fact, some of them are quite decent. I guess it's because each of them in their own way, lacks that certain je ne sais quoi that takes them from just okay to truly outstanding. But have you ever wondered why that is? What is it that really makes us fall in love with a story? They are a means of escape. Belle from Beauty & the Beast said it best, "Far off places, daring sword fights, magic spells, a prince in disguise." These books can take you to any number of places (real or imagined). I get to cultivate experiences and go places that I might never have to opportunity to see in my lifetime (or ever). I'm all about broadening my horizons in any way that I can and a truly exceptional book will transport me away from reality, if only for a little while. I can relate to them. Whether it be the situation, a character or an overarching message, books that make me empathize are the ones that linger. These books give me insights that I hadn't thought of before and they show me that despite the overarching conflict, everything will be okay. At a baser level, we all crave intimacy and there's nothing better than forging a personal connection to a character because you've been there, done that before. They challenge me. My beliefs, my values and my perceptions can be completely altered because of these stories. And some will allow me to face my deepest fears without posing real risk in my every day life. I can navigate through them via the characters and come out on the other end feeling stronger and wiser because of it. More simply put, reading these kinds of books makes me a smarter, happier and more well rounded person. Inspiration and creativity are products of reading them. Truly amazing books satiate my need for creativity. They fuel my imagination in new and engaging ways. They challenge me to think outside the box. They inspire me to step outside my comfort zone and try new things. They not only make me want to be a writer, but they reaffirm that I can be. They say everything I've always wanted to say but didn't know how. There's nothing that feeds my soul more than a beautifully written book. But it's not just the words that make it memorable, its the thoughts, emotions and sentiment behind them that matter. These stories echo my feelings and emotions in that perfectly eloquent way. They literally leave me at a loss for words. 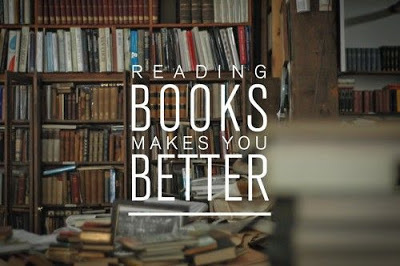 There are any number of reasons why we read, all of them equally important. In a world that's full of books, we should hold on to those special few that occupy that book nook in our hearts and understand exactly why they do. I love nothing more than the experience of a powerful story, because that's what it is, we don't just read it ---- we experience it. And I don't know about you, but that's the biggest reason why I love to read. So, why do you read? And what makes one story stand out from all the others? Are there any books that have profoundly changed your life? If so, which ones were they and why? "They say everything I've always wanted to say but didn't know how"<-That's perfectly said. Your reasons are the same as mine, reading just takes me away, broadens my horizons and makes me run a gamut of emotions. Plus, my favorite books have characters and events I can revisit anytime I feel like it. The books I love have passion, engaging and multifaceted characters and lovely settings within their pages. A few books have really made an impact on me, like J.R.R. Tolkien's The Hobbit and his LOTR's trilogy. Many years ago when I was going through a rough patch in my late teens, I started reading The Hobbit and went onto finish the LOTR books right after. 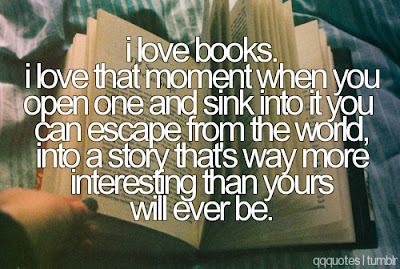 I'll never forget how I was able to escape for a bit within those pages, and just live inside there for a little while. Tolkien created this magical world and I was in awe of the storyline and the characters. He blew me away and made me love reading even more. Its books like those that you never forget. Great post and topic! What about you Nikki? What books were life changing for you? I agree with you, Naida! In really impactful stories, the characters can almost become like beloved, well-known friends which makes it feel so much more personal. Books like that can get you through those tough times (much like LOTR did for you). I'd have to say The Complete Tales of Beatrix Potter did that for me when I was much younger. I'd also say Every Day from David Levitghan and To Kill A Mockingbird by Harper Lee were pretty powerful. Also, Dracula is one that's stuck. I just really enjoyed the gothic, adventurous nature of the story. I love this post, because I love the idea of stories. I love books, of course, but I love stories in other avenues too. Oral stories, lived stories, I just really like the idea that humans connect better with a story, no matter it's format, than we do with threats or statistics or almost any other persuasive means. We just connect with stories so well. Stories to me are all the things you listed above. They allow me to feel experienced and traveled even when I'm in the same spot. They inspire me to think more, laugh more, and even live better, to have my life worthy of a story someone writes down someday. I don't know if there's anything better than really connecting with a story on an emotional level--as you said, that says everything you've wanted to say but don't know how. It's almost like meaning being is being imparted on your ideas and everything you've wanted to say because suddenly you're not alone, you have that shared story. You bring up a good point, Stormy. Books are just one popular method of storytelling and I think we do need to still have an appreciation for those other forms as well. Stories are a very powerful thing, the way they have the ability to circulate new ideas and change a life. They manage to be teachers, counselers and friends all at the same time and when we can share those experiences with others, it makes it even better! I have no idea what makes a story stand out from the others. I think the only thing my 5-star books have in common is that they "clicked" for me in some way. Not that they're without fault, and not even that they're better (whatever way you want to define that) than the ones that didn't quite make the cut. I can't explain it, I just know it when I see it, I guess. Sometimes its those little faults/imperfections in the stories or their characters that make them stick. I love that books have the ability to resonate so powerfully with us. I am an avid reader and I have been since I was a little. I love reading a book because it gives me a chance to escape the real world that usually isn't all that great. I give a five star review when the book has enticed and excited me so much that I couldn't put it down, I recommend everyone else to read it (really I tell them they MUST read it), and I have that feeling when I finish it that this story is one I won't soon forget. Thanks, Kay! There aren't many books that I would suggest to anyone and everyone, but the few that I do, it's because they spoke to me in a very real and powerful way. It still amazes me that stories have the ability to transcend through time and still remain relevant. It amazes me how a bunch of bound words can make us laugh, hope and cry. It's a truly beautiful thing! Oh, tough question - I have a really hard time defining what I like in a book, but I know myself well enough to know I need really good world-building to really get lost in a book. And yes, to care about the characters, but if I don't believe in the world, I can't believe in the characters. Yes, decent world-building is a MUST otherwise it's impossible to really buy into any of it. And I totally agree with you, Kat. Books that make me think and challenge my views on life are always appreciated. HOORAY FOR HISTORICAL FICTION (and zombies)! Nikki, I really love this post. For me personally, I think that what makes me truly love a story is when I feel deeply connected to the character -- and that character ends up feeling like a real person and someone I could be BFF with. I also love when books make me legit swoon. Not like a blah tepid romance but one where it feels authentic. OH OH and that is key too -- authenticity when the voice feels real. Sure the setting and story don't have to be contemporary, but they do have to feel real, ya know? Aww, thanks April! When you feel that connection to the character and you FEEL ALL THE FEELS, the book becomes so much more personal and it resonates more deeply. Ah, authenticity --- YES! YES! YES! Even if the situations are impossible (flying dragons, sure! Why not? ), if the author's voice and the world feel real, then I'm more willing to believe that anything is possible. Ah, swoony times. Those are always a win. Oh goodness this is a fantastic post! I've never thought through this question, but you're totally right. There are some books that just resonate with me on a deep and meaningful level, and many books that I like, but don't take me there. I love all your reasons above. I think the last one "They say everything I've always wanted to say but didn't know how" is particularly striking. When a book is a GOOD story but is also WELL written, it is something that I latch onto. I also love authors that write with subtlety and make you pay attention to little details and movements. Melina Marchetta and Maggie Stievater are two authors who write in a way that seems just for me sometimes. The way that they craft their stories blows me away. I also love when you talk about escape and also books that relate to our lives. I think the second is why I loved Just One Day so much, though it would have been a fantastic story even without that. Thank you for this thoughtful post. You're so sweet, Lauren, thank you! I guess I've been in a bit of a reading rut lately and that got me thinking about why some books are just better than others. It's not that what I've been reading is bad, but these books don't stick in a way that others do. The biggest thing is the relatability factor. Even if the situations are totally out there, if the character or the sentiment feels real to me, then I'm more liable to connect with them. And you've nailed it with Maggie Stiefvater (I haven't yet read anything by Marchetta). Her writing is so exsquisite with these quirky yet subtle nuances that just blow me away time and time again. Beautiful!